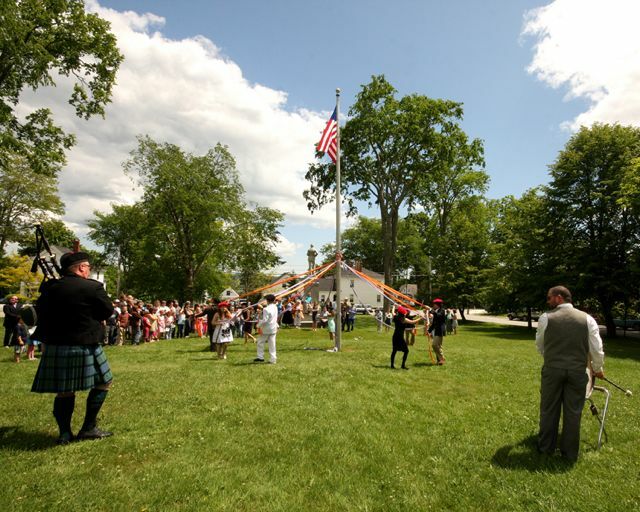 Photo: Piping for the Class of 2010, Adams School, Castine, Maine. THIS is the story of why I play the bagpipes, and it begins more than a hundred years ago. On July 2, 1867, at 23 Hunter St. in Glasgow, Scotland, Alexander Neilson, a journeyman joiner, and Jeanie Callum, listed simply as “spinster” in the record, were married by Rev. Woodrow Thompson of St. Luke’s Church. Alexander was 24 years old, son of Agnes and James Neilson, ploughman. Jeanie was 23, one of the eight children of James Callum, shoemaker, and M. S. Cave. Soon after their marriage, they emigrated to Toronto, eventually settling in Erie County, New York. They had a son, James, who named his son Robert, who named his son Robert, who named his son Todd. In May 1977, a couple of weeks before I married Lesley Anne Brody, of Englewood, New Jersey, wearing a kilt made for the occasion, my grandfather (the elder of the Roberts) and I sought the family records in the official registry house in Edinburgh. The lore of our Scottish origins had been passed along to me by my grandfather, whose own appreciation of these roots seemed to grow with my interest and involvement. Who were “our people,” back beyond living memory? What was their land like? Who and where are the unknown branches of our clan? SEEING the old marriage record helped me to envision the character and life of these forebears. The Neilsons were humble folk, probably typical of their social class in mid-19th century Glasgow. Scotland, evidently, held no promise of prosperity. Even so, it must have taken great courage or desperation to leave family, friends, the known world and set out for America. Neither saw Scotland again, though it had roots in their memory; Jeanie’s Glasgow accent never faded and, according to my grandfather’s recollections of her, she still knew her childhood friends by name at age 80, 60 years away from the neighborhood playmates of her youth. Just how Neilson changed to Nelson no one knows. Perhaps it was due to their thick accents twisting vowels in a manner incomprehensible to a certain immigration official. It was a common enough occurrence among immigrant families, though here there was, technically, no real language barrier to blame. Rediscovering the original family name is part of the romance of acquiring the concept of a distant homeland and particularly an affiliation with a clan. Neilson is a sept of clan Gunn, one of several Scottish clans of Norse origin. Before Neilson, I figure, there had been Nils Nilson the Red, a viking who was fed up with Oslo and set out across the North Sea to become a Scot. My interest in my family heritage has led to several trips to Scotland and, eventually, to the bagpipes. I went to “the old country” for the first time at age 14. We happened to be living in London because of my father’s work. One June evening, my parents put me on a train at Euston Station to go to Burghead, near Elgin, on the Moray Firth for an intense 28-day Outward Bound course. The overnight train ride was filled with mystery noises of mail and freight stops at deserted stations and, eventually, the early morning desolate beauty of the Cairngorm mountains. We arrived at Elgin and were ferried by bus to the little fishing village of Burghead, with its walled, snug harbor and neat cottages. There were three other Americans among the 120 teenage boys, mostly from Glasgow. While we were generally accepted, some of the Scots in Churchill Watch, my team of 12, never dropped their skepticism of us “Yanks.” Others were like cousins from the start, and some had accents so thick that I never did understand more than two or three words per sentence. It was the first time I ever felt like a minority, language and nationality being quite a barrier at times. THINGS warmed up as we were put into the position of depending on one another. Kevin, the son of an accountant, spent miles of our Western Highland hikes in conversation comparing our different lives. Brian Todd, the postman’s son who had resigned himself to the inevitable nickname of “Sweeney,” had a whimsical curiosity about my accent that lasted all month. He loved to hear me say things “in American” and would spend hours giving me sentences to repeat. He also couldn’t get over the fact that Todd was my first name, Nelson being the more common as a Christian name in Scotland. For me, Outward Bound was less about physical endurance than about cooperation and camaraderie. We learned trust by rock climbing on sea cliffs, sailing open cutters across the firth, orienteering in dense fog in the Cairngorms, and cleaning pots and pans. Each day started with a cold shower and ended with calisthenics, conducted like highland games, complete with a piper. We ran 10-mile marathons through the woods and went on solo overnights along the desolate coast. I slept warm and dry in a sandy cave on the beach while Kevin got a good drenching sleeping out in the open. At 3 a.m., however, I was surprised as two Royal Air Force fighter jets rocketed in low over my sanctuary on their approach to the Lossiemouth Naval Air Station. My next trip to Scotland was for a junior year of college at Stirling University. My tutorials in Shakespeare, the Romantics, and “Eliot, Pound, and Auden” were rigorous and intriguing. But it was studying American poetry with Ian MacAllister, a highlander, which was most interesting. He was amused at the American in his class and would ask my opinion of certain nuances in the poems. He would often interrupt the discussion of, say, Walt Whitman, to regale us with family stories from small-town highland life. Mostly I studied the lives of my fellow residents of Murray Hall: Malcolm, Ian, Mark, and Robin. I toured the countryside in Robin’s aged green Morgan, which was built like a tank with running boards and started with a hand crank. Ian and I drove around the Isle of Skye and the Western Highlands during February break, the two of us sleeping in the front seats of his Volkswagen bug. Ian was all of 5 feet tall, but I’m over 6 feet. One night, tired of the contortions necessitated by the cramped bug, I opened the door and rolled out onto the grass at the side of the tiny lane in order to stretch out. At daylight I awakened to find a number of sheep lying contentedly nearby, enjoying the mist, munching on the grasses, watching me. In May, I had a kilt made of the Gunn tartan, finished my university courses, and prepared to return home and marry. But before returning to America, I had the pleasure of introducing my grandfather to Scotland. We saw Edinburgh, Stirling, Aberdeen, Dundee, even the Queen’s castle at Balmoral. It was his first trip abroad and became a kind of pilgrimage to the homeland. The high point of the trip for us both was the moment when we opened the leather-bound ledger of marriage records and located the line where, in an antique hand and faded brown ink, the record of Alexander and Jeanie’s wedding was inscribed. It authenticated family lore, linked worlds, and returned us to a former time. Lacking birth dates or locations with which to search parish records, we couldn’t trace the lineage any further back in time, since in Scotland the first national census was not taken until 1865. This story is contained in the music of the bagpipes. They say that it takes seven generations to raise up a true piper in a family, and that piper must practice for seven years to achieve recognition. I started late, at age 23. But within a year of beginning my weekly lesson with pipe major Archibald T. Macleod, an engineer for the MBTA in Boston who traced the lineage of his piping teachers back to the legendary MacCrimmons, the hereditary pipers to the chieftains of Clan MacDonald of Skye, I was attending a weekly pipe-band practice, marching in parades on virtually every holiday, attending band competitions at highland games, and playing for Burns Night celebrations. I have played the pipes at many weddings and always wished that my wife and I had heard the pipes at ours. Piobaireachd consists of long compositions written for momentous occasions: battle, the retiring of an old sword, the honor of a clan chief, welcoming, marrying, or mourning him. It is a composition for solo pipes in which a simple theme is announced and then articulated in more and more elaborate rippling sequences of grace notes, similar to the Indian raga. Piobaireachd reveals the true mettle of the piper. It is the ancient music and that which connects any modern piper with the MacCrimmons who laid down its tenets more than 300 years ago. It is the music of Rannoch Moor. My children usually put their fingers in their ears or run away when I start up the pipes. And yet when I attend their school’s International Day piping and wearing the kilt, they seem to have a measure of pride, at least enough to be seen parading around with me. Spencer will even go so far as to wear one of our kilts, though it wraps around him twice and drapes well below his knees. It looks great with his high-top sneakers. And he has figured out several tunes on the bagpipes practice chanter: “Amazing Grace,” the “Ode to Joy” from Beethoven’s Ninth, and the last few bars of the “Star Spangled Banner.” But he insists he does not want to play the pipes and rejects my offers to teach him pipe tunes. Last May, we went as a family to the local highland games, a gathering of pipers and dancers from throughout the San Francisco area. The girls took an interest in the sword dance, Spencer in the swords. No matter how much I play the pipes, hearing them played well still gives me a shiver down my spine and moves me to tears. It is a visceral sound, redolent of landscape, history, and a people’s joys and sorrows, intelligible perhaps as soul music or the Celtic form of the blues. We found the clan Gunn tent after our picnic lunch and were intrigued to discover an active Gunn society flourishing out here on the West Coast. We mailed a Gunn postcard, with clan tartan and badge, back to my grandfather and mused on how the music of a tiny country has preserved and inspired kinship across time and continents. I’m worlds away from Glasgow in 1867, but the big music of the pipes makes it a powerful connection nonetheless.